Arsenal manager Unai Emery has stated that he could start Pierre-Emerick Aubameyang and Alexandre Lacazette upfront together when the Europa League begins. The Gunners have made a miserable start to their latest Premier League campaign, losing to Manchester City and Chelsea respectively in the space of a week. City comfortably defeated Emery’s men 2-0 last Sunday whilst The Blues managed to secure a 3-2 victory against them on Saturday, in a pulsating contest which could have gone either way. The new Arsenal boss will have taken the positives from their latest defeat which at least showed that they can trouble the best teams in the league going forward, but he would equally have been alarmed by the number of missed chances his team had throughout the 90 minutes. Aubameyang and Henrikh Mkhitaryan both squandered guilt edge opportunities in the first half which could have given the North Londoners a healthy halftime advantage, with Alexandre Lacazette once again having to make do with a cameo appearance from the bench. 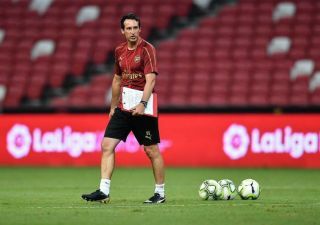 According to Football London, Emery has now suggested that he could use his two main strikers – with a combined value of £101m – together in upcoming games, saying European football could force him to make regular changes. “The possibility to play Aubameyang and Lacazette is okay because we tried that in pre-season and also last year they played together.” The Gunners boss told reporters. “For me it is about finding a good balance for all that we want in attacking and defensive moments. Arsenal’s next Premier League fixture is on Saturday at The Emirates against West Ham United, who have also lost their opening two matches. Supporters will hope that the team can grab their first three points of the new season and start climbing the table after a difficult start to their 2018-19 campaign.